Great news to all the Breaking Bad fans worldwide. Thanks to the cooperation between AMC and IGT (International Game Technology), now you can enjoy Walt, Jesse and all your favorite characters while playing the new Breaking Bad slot. The slot was recently revealed at the 2015 Global Gaming Expo and should appear on Vegas casino floors somewhere during 2016. Here is a short review of the game: design, symbols, bonus features and more. Edit: you might be interested to check Aristocrat’s Sons of Anarchy slot. Breaking Bad is not a small slot 🙂 and we are being ironic here. It’s huge. Similar to other IGT Tower machines, Breaking Bad slot features 2 screens: the smaller touch screen which is used for the regular play and the monster HD screen on top, which displays videos from the original series and gets activated during the special Heisenberg’s Super Free Spins, which we will get into later. Naturally, the symbols include all the main characters, Walt, Jesse, Skyler and Hank, the elements from the periodic table and the famous van, which is the wild symbol of the game. Surprisingly, Breaking Bad offers only 2 main bonus features, however they are quite rewarding. The main bonus game is the Chemical Reaction Free Spins, 5 to be exact. To activate the bonus you’ll need to get three bonus symbols on reels 1, 3 and 5. The best part here is the Random Wild feature. What happens here is that every spin, one of the chemical elements will randomly turn wild (on every position it appears on the screen), which usually generates really nice payouts. If you collect 5 or more Golden Moth symbols during the free spins, you will be forwarded to the special Heisenberg’s spins. Those are played on the top screen and use 3 different sets of reels. You start with Mr White Pay and move on to Chemist Pays and Heisenberg Pays. Since it was only the preview, it wasn’t possible to play this slot for real money, but only as a free slot. Still, it seems that the Heisenberg spins are not that rewarding compared to the regular free spins and the random wild. Although I have to admit that they are very visually attractive. 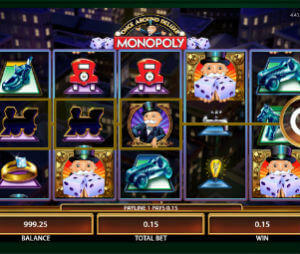 Great slot with cool design and graphics and rewarding bonus features. Can’t wait to see it in Vegas casinos.